In general, average cognitive function declines across much of the adult life span. This decline has come to be understood as normative, though the rates of decline and the ages at which they commence vary across different aspects of function. Decline takes place in the context of much larger variation among individuals of any given age, and the rates of decline show individual differences as well. Although characterization of these normative patterns is now quite good, understanding of what drives the changes is much more limited. 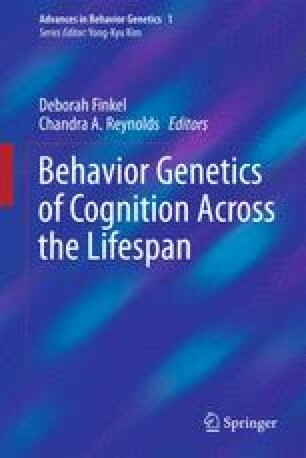 In this chapter, we review studies that have used a variety of different behavior genetic analytical approaches to investigate some of the thorniest questions facing cognitive aging, but we also highlight areas ripe for future behavior genetic approaches. We review quantitative genetic studies that have taken both cross-sectional and longitudinal approaches, as well as studies that have examined the extent to which different aspects of cognitive function and variables with which it is associated show common genetic influences. We then turn to behavior genetic contributions to special topics in cognitive aging including intra-individual variability and terminal decline, the problems of sample selectivity, and gene-environment correlation. Following these topics involving aggregate genetic contributions to individual differences, we consider molecular genetic approaches to identifying individual genes involved in cognitive aging.